Zawinul has launched a new official web site, www.zawinulmusic.com. There are some cool pictures in the gallery, including a young Joe with his very first accordion. There are also photographs from the opening of Joe Zawinul’s Birdland in Vienna. On December 29 the Penguin Group will release Michelle Mercer’s new biography of Wayne Shorter, Footprints: The Life and Music of Wayne Shorter. The first book-length bio on Shorter, this should be a most welcome addition to the libraries of Shorter and Weather Report fans. A companion double CD was released by Sony Legacy on November 16. The compilation spans Wayne’s career from his days with Art Blakey right through to his current quartet with Brian Blade, Danilo Perez and John Patitucci. ESC Records has announced a January 31, 2005 release date for Midnight Jam, the live double CD recording of Zawinul’s 70th birthday party concert at the Leverkusener Jazztage in 2002. That seems to be a European release date. No word on the stateside release yet. ESC has posted additional information about the release, including the tunes on the recording. Much of the CD captures the 2002 edition of the Syndicate, with Paco Sery, Etienne MBappé, Amit Chatterjee, Manolo Badrena and Sabine Kabongo. Maria Joao performs on two cuts, and Alex Acuña guests on three. The WDR Big Band, under the direction of Vince Mendoza, gets four tracks, performing “Night Passage,” “In A Silent Way,” “Badia/Boogie Woogie Waltz,” and “D Flat Waltz.” Guests of the big band are Peter Erskine on drums, Victor Bailey on bass, Alex Acuña on percussion, and Scott Kinsey on keyboards. Meanwhile, Zawinul will release a live recording of the Syndicate’s performances at his club Birdland in Vienna, Austria. The bulk of the material comes from the band’s week-long stand at the end of September, featuring musicians from around the globe: Linley Marthe (Bass) from Mauritius, Karim Ziad (Drums, vocals) from Algeria, Sabine Kabongo (vocals) from Belgium via the Congo, Marc Aziz Sahmaoui (gembri, perc, vocals) from Morocco, Arto Tuncboyaciyan (percussion, vocals) from Armenia, Alegre Corrêa (guitar) from Vienna via Brasil, and Scott Henderson (guitar) from the United States. Also included will be two songs recorded during the Syndicate’s May performances which opened the club. The line-up then was Zawinul, Nathaniel Townsley III (drums), Marthe, Kabongo, Badrena and Chatterjee. This album will be released on Zawinul’s new label, BirdJam, created solely for live performances of artists appearing at Birdland. No word yet on a release date. Zawinul Wins Down Beat Readers Poll. Again. The readers of Down Beat magazine named Zawinul the top synthesist for the umpteenth time in the magazine’s annual readers poll, published in the December issue. I wonder when and if the readers will vote Zawinul into the magazine’s Hall of Fame. (Yes, there is actually a Down Beat Hall of Fame Museum in Orlando, Florida.) I’ve been a subscriber for years, but I have never voted, so it’s not like this weighs on my mind. But Wayne Shorter was voted into the hall last year by the music critics, and Jaco Pastorius was voted in by the readers in 1988 following his death. Zawinul, however, has never appeared to have gotten close. This year the readers elected McCoy Tyner–certainly deserving. Ray Charles came in second, and he will almost assuredly go in next year by either the critics or the readers. After Charles, the readers voted for Nancy Wilson, Mark Murphy, Joe Williams, Four Freshman, Herbie Hancock, Keith Jarrett, Steve Lacey, Lee Konitz, Illinois Jacquet, Errol Garner, Sonny Stitt, and Billy Higgins. Come on… you can’t tell me that Zawinul shouldn’t rank amongst them somewhere. I guess I need to start voting. Long-time Zawinul percussionist Manolo Badrena is profiled in a one-page article in the November issue of JazzTimes magazine. I didn’t know that Heavy Weather was the first time Badrena set foot in a recording studio. 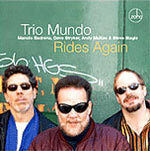 Much of the article talks about Trio Mundo, the band that Badrena formed with guitarist Dave Stryker, bassist Andy McKee, and saxophonist Steve Slagle. More info can be found at the ZoHo recording label web site.